Although taped on 4/20/2006, this interview with Ira Millstein, Senior Partner, Weil, Gotshal & Manges, was not posted to YouTube until this month. 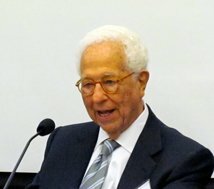 Millstein discusses corporations, corruption, and regulation. Listen and learn about changes that have been made and some of what remains to be done. In the history of corporate governance, Ira Millstein has occupied a prominent position for several decades. In May 1956, Richard D. Heffner, American historian, broadcaster, and University Professor of Communications and Public Policy at Rutgers, began a weekly public television series called The Open Mind. Well ahead of its time, the program has welcomed hundreds of interesting and influential persons from all fields to speak freely and to share their thoughts and ideas with a broad audience. In addition to his active legal practice, Ira Millstein is chair of the Ira M. Millstein Center for Global Markets and Corporate Ownership at Columbia Law School. Their mission is to bring world class scholarship, research and academic rigor to the vital task of restoring and strengthening long-term financing of innovative and durable public corporations, which are the underpinning of economic growth. This mission is essential given today’s capital markets which are global, complex and volatile, and bring consequences and uncertainties to those who rely on them: companies, investors, and ultimately the wider economy.